Pull up, lift up, stand taller, push into the ground more….all these refers to that supporting leg. I had no idea how much I had been “sitting” on my supporting leg, until I began to advance in dancing ballet. Why I have labeled this post as an advanced post in adult ballet, is because, when you’re an adult learning in beginner and Intermediate ballet, there is so much to do. The focus will then be trying to learn basic positions and vocabulary, improve the coordination, remembering the steps and how to link them altogether. Learning the correct placement and establishing them into muscle memory may take at least a year. Thus, a teacher may be satisfied with your less-than-pulled-up supporting leg, to help you through all that beginner and Intermediate stuff, just so you could dance. You may not have yet developed the ballet eyes to figure out what she means by pulling up of your legs. You probably can’t tell and feel the difference! However, once you progress to an advanced level, you would need this strongly pulled up lengthened supporting leg more and more, in order to be to learn and execute advanced steps. It is amazing how much I had to go back to the basics, and work those beginner ballet steps with a much higher quality. I have to have a greater clarity and purity when I approach a basic step or position. I had to re-visit how I stood in bras bas position (preparatory position), re-place my arms in first, and in 5th position. I had to keep working on my tight 5th position. In fact, my teacher said, even as professionals, they never stop working to try to get a better 5th position, throughout their career. 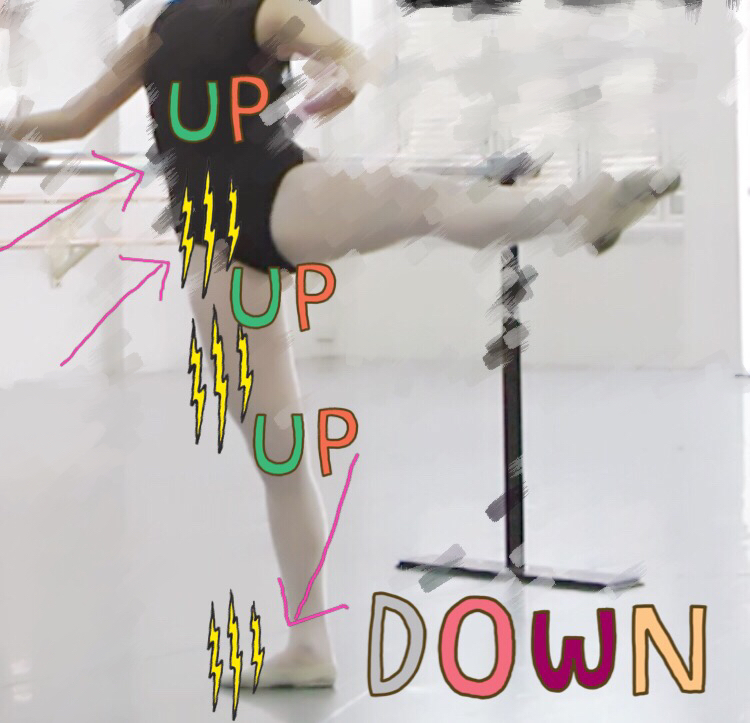 I had to work on how I do my port de bras in seconde sideways towards the barre. My shoulders had to be kept down more, yet not compromising on the reach, keeping my elbows curved in a way that framed my head. All these things I had to re-establish them into a higher standard and then set it in ‘stone’ into my muscle memory. Conscious thinking must be done constantly before it comes a habit. I have to constantly think about pulling up my supporting side, lest I sink and sit. I have to use my brain to command and activate those muscles, otherwise they won’t do it! I have to do this enough times in order for this to become a habit. Since I do not pull up my supporting side enough naturally, I have to still consciously think about this during ballet class. Where is my weight? It has to be somewhere over my toes at the ball of my foot. I have to ensure my pelvis is not tilted and remains square. Say I’m standing on my left leg, I also have to think about the pull up force going through the left side of my pelvis, through the left side of my ribs and the force going through the center of my body, while keeping my shoulders pressed down. I also think about my glutes and all the muscles holding my turn out, because I’m working with my maximum rotation. I should work with my maximum rotation all the time. Though I have titled this article “Pull up on that supporting leg”, the pull up action goes beyond your leg. The left side of your body should be pulled up too, and through center them in your imaginary center axis, so that you’re square in correct placement. Some dancers’ think of only the leg, and that is why they can’t seem to stabilize their upper body. They forget to engage the core, but try so hard to keep their body still that they tense up their neck and shoulders. The ‘pull up’ force actually goes down into and under the floor, and is lifted through the pelvis, up the core and above. However, you don’t ‘pull up’ from the chest. The chest area remains relaxed and shoulders held. Well I’m working on it. This stems also from my basic preparatory position when I’m standing at the barre. I mostly forget and just…stand (kinda sit) there. I must remember “push down and pull up” ballet visual like the uncorking of a champagne bottle. (note to self, note to self, note to self). Those dancers who have had proper training usually don’t think about this, especially when trained from a child. They already have it and they don’t seem to understand why us adult dancers struggle with this. The arrows are the areas I think about to activate the muscles, the yellow ‘lightning’ is where I send energy to mentally. Most adult dancers understand this concept much quicker than children or teenagers. However, we may not yet have the strength and stamina to execute this pull up. You may be able to achieve this pull up for 1 second, but due to the lack to stamina, your leg ‘lets go’ and you end up ‘sitting on it’. Don’t be discouraged. This is only natural. I remember when I first had to ‘pull up’ my supporting leg, and ‘stand taller’ on it. I could only hold my maximum strength for about 5 seconds. That was simply standing still in preparatory position at the barre! When I established some strength, I then had to increase this to be able to execute this pull up during plies and tendu exercises. I would collapse over the barre catching my breath like this but I won’t be smiling. I remember being completely taken aback in surprise at how weak I was. I would collapse over the barre and try to catch my breath after each exercise (see picture). It felt as though my muscles were burning. My teacher would not let me do any exercises with my previous sub-standard pull up (actually I was sitting on my leg all this while unknowingly). While training to gain the strength for this pull up of supporting leg, I literally dreaded and hated slow plies and slow tendus, because you’re forced to work purely and clearly. I remember hating those two exercises because of how exhausted it made me. I also forced myself not to ‘let go’ and try to work in the purest way I know how during easy open classes (I went back to basic beginner class to do this). However, after a month or two, I gained the strength and suddenly I realized I wasn’t collapsing after each exercise. That doesn’t mean I have sufficient strength yet. I have to gain enough strength and stamina to last the entire barre and support me in center. I need it to become a habit, so that I can learn more advanced steps properly. Although I am still working on gaining strength in both legs, I have noticed something. My right side is more pulled up than my left…naturally. If we had to do a balance in retire position, I would be able to let go of the barre right away if I’m standing on my right side. I take a longer time to find my center on my left side. I’m sure it is different for everybody, but I particularly have a lazy left supporting side. Maybe, it is just not strong as the right side. Thus, I struggle to achieve that pull up much more on the left. My friends and I joke about our ‘weaker’ side. We all agree it is as though one side of our body has less nerves than the other side. I literally feel less nerves firing when I’m on my left side. And that is why, my teacher tells me I’m more pulled up on my left pirouettes (because I’m more pulled up on my right side. It the right leg that I’m balancing on when I’m turning). It is no coincidence that I’m a left turner too. Though I have to train both sides, I feel encouraged that at least I have something…a good side! When should you be thinking about supporting leg? That really depends on where you are in your technique. These days, I focus mostly on supporting leg throughout the barre because I don’t have that habit yet. This is unless the combinations are more complicated and I have to think about placement. In the center exercises, I think about supporting leg especially during adagio and tendus. I’m often surprised at how much better and more stable I am in the center when I’ve been disciplined to keep working my supporting side during the barre. I shook my head, thinking it was a stroke of luck. Though I’m a lot stronger on my supporting side than before, I STILL feel I have insufficient strength and stamina to carry me to the center. I still do not have enough to support what I need to do. But that’s just how ballet is isn’t it? We must always work towards that elusive perfection. Even for professionals, it’s normal for them to be dissatisfied with their pelvis placement, or arms, or 5th position or turns etc. Thus, they are constantly working it. I don’t believe we should beat ourselves up when we’re not good enough like all those crazy misrepresented ballet TV shows. I like to see it as rather, having a humble attitude to keep working hard and keep improving. Having a strong pulled up supporting leg not only is essential to be able to execute advanced steps, but dancing becomes more beautiful too. It simply looks a lot better. You can actually see the difference in energy in the dancing when there is a pulled up supporting leg. With a pulled up supporting side, your core is engaged and you’re actually in more control of your body. Your upper body can actually relax, because it is being supported by a very strong base (your legs and core). That is how dancers look so relaxed and seem to be dancing with minimal effort. Funnily, I used to be so frustrated with the heavy tension in my face, neck and upper back. My body naturally tensed up because I had a shaking foundation to dance on. I now realize it is due to the disconnect of the supporting side: my legs and core and upper body was out of sync. I am grateful that I get a chance now to work this part of ballet technique which I need. I can’t wait for it to become a habit, so that I don’t really have to think about it anymore!